I read this book for the 2016 Goodreads Read Harder Challenge: Read a book by a Southeast Asian author. Just looking for an author that satisfied that category, I learned I didn't even know what countries were considered "Southeast Asian". 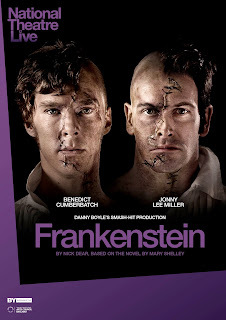 Frankenstein by the National Theatre Live, starring Benedict Cumberbatch and Jonny Lee Miller (from Hackers!). Filmed live, the result is simulcast to movie theaters. I missed seeing it last year, since the closest theater showing it was 100 miles away. This year, the NTLive newsletter from June told me it would be playing at my local theater and I bought a ticket that day. The play is based on the book, so many might not have really known what was going to be in it. In fact, on the way oyt I heard an older man asked if it was bad on the book, after an older woman said it wasn't what she expected and didn't like it. I assured him they did a very good job. It was condensed, as it would have to be, and done in such a way that the disjointed, jarring nature played well with the grotesque and tragic acting, set, and direction. It was fantastic. I read this book two two reasons: Secondly, I was tasked with a biography for the 2016 Goodreads Read Harder Challenge; Firstly, I own "The Sound of Wings" by Mary Lovell but haven't been able to convince myself to continue it, though I really liked it when I started it in May 2014. I read this book for the 2016 Goodreads Read Harder challenge, and I'm so glad I did. I never would have picked it up otherwise. "A FOOD memoir? Ugh." Honestly I had a moment where I wondered how to get around the requirement, but it stuck out at me from the "recommended books in this genre" list. You can read the accolades and summary for yourself, but know I agree with them.